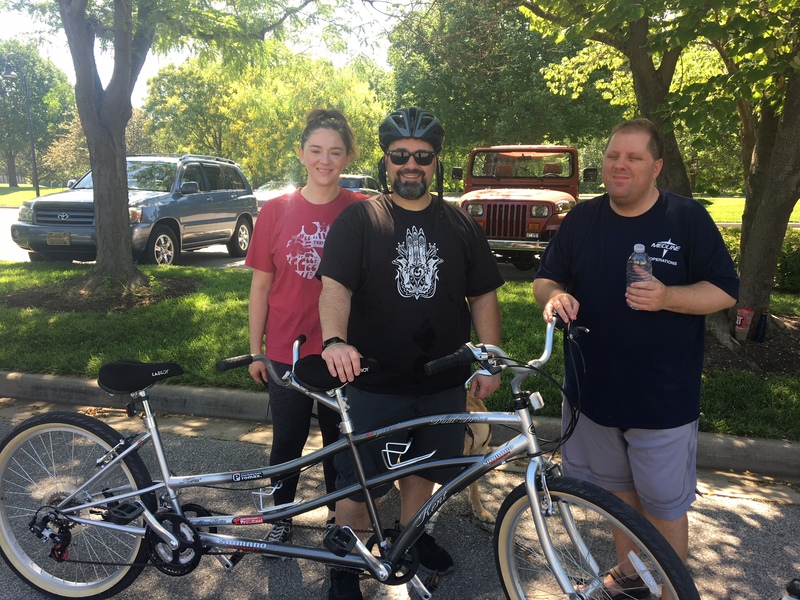 Last weekend, BikeWalkKC teamed up with The Whole Person to offer people with low vision a fun bicycle ride. After our instructors gave a quick lesson on tandem bicycling, the pairs took off on rides around Leawood Park. Instructors from our Education Team, volunteers from The Whole Person, and volunteers from our Board of Directors rode as “captains” on the bicycles-built-for-two, while participants pedaled the “stoker” position on the back seat. All smiles at the tandem ride last Saturday, despite the heat! Our team was delighted to be part of the Blindness Low Vision Experience again, a program BikeWalkKC has engaged with since 2016. Riding a tandem bike requires lots of trust, coordination, and communication between the captain and the stoker. This means you get to know each other quickly, even on a short ride. “It’s a whole new way to appreciate riding a bike when you have to break down every single action because the person behind you is depending on that communication in order to enjoy themselves and to stay safe,” says Laura Steele, Education and Outreach Coordinator at BikeWalkKC. The Whole Person strives to “connect people with disabilities to the resources they need by supporting independent choice and advocating for positive change in the community.” We value their partnership in creating a culture of active living here in Kansas City, from advocating for safer and more accessible sidewalks and crosswalks to fun events like the bike rides. It has been said that a tandem bicycle can make or break a relationship, and we are happy to report that our friendship with The Whole Person has only grown stronger!